SpaceX chief Elon Musk has spoke of his desire to make Falcon 9 the first fully reusable launch vehicle, which he would “love” to include a flyback first stage. Musk also noted he is aiming for Falcon 9 to launch in under 60 minutes from the moment they leave their hangers. SpaceX is coming off the back of an encouraging conclusion to 2008, with the successful Flight 4 of their Falcon I launch vehicle, and progress towards the 2009 flight of their Falcon 9 launch vehicle. Space X also won 46 percent of NASA’s $.3.5 billion dollar Commercial Resupply Services (CRS) contract. “The Falcon 9 tanks are all friction stir weld – and the F9 is largest fully friction stir welded structure in the world. The 180 feet long vehicle is assembled horizontally and the rolls out to the pad to be placed vertical for launch,” he noted. The launch date for Falcon 9’s debut remains fluid, although the vehicle itself is not the determining factor in trying to make a summer launch, claims Musk. Musk went on to speak about the Dragon capsule that will fly with the manned version of the Falcon 9, noting that SpaceX are looking to enable the vehicle to land anywhere in the world, by adding land landing capability. 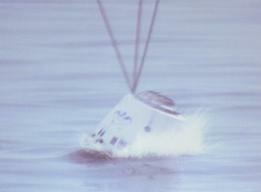 (Image Left: SpaceX Dragon splashdown). NASA’s Orion lost nominal land landing capabilities via one of its numerous mass saving exercises – causes by performance shortfalls with the Ares I launch vehicle. “There’s no major difference in appearance between the manned and unmanned version of Falcon 9, apart from the Launch Escape Tower (and the Dragon spacecraft for human passengers),” Musk noted. 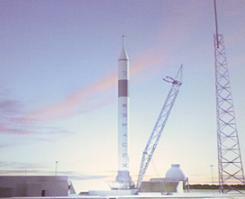 A large part of the speech – the audio (50 minutes) and over 50 slides from the presentation are available on L2’s SpaceX subsection (only click if you are a L2 member) – was dedicated towards SpaceX’s full reusability ambitions, with hints towards using Falcon 1 as a test bed for “beefing up” protection on the stages to allow for reuse, before the full capability is added to the Falcon 9. “If you look at any other mode of transportation like a bike or a horse, how many people would use that mode of transportation if it wasn’t reusable? “Even if you make the vehicle very efficient, and create the most optimal trajectory, you are still only getting two to three percent of your launch mass to orbit. “You have to make recovery systems robust enough to withstand re-entry and that is a very difficult problem – no one has really solved that problem yet. At SpaceX we’re trying to make the first stage reusable. “With Falcon I’s fourth launch, the first stage got cooked, so we’re going to beef up the Thermal Protection System (TPS). By flight six we think it’s highly likely we’ll recover the first stage, and when we get it back we’ll see what survived through re-entry, and what got fried, and carry on with the process. Musk also spoke about his wish to enable the first stage with flyback capability, but added that he would require a large sum of cash to achieve that goal. “Any pound you use for reusability and re-entry (on the second stage) is a pound subtracted directly from payload, whereas first stage it’s a five to one ratio. This is a problem we’re trying to solve incrementally, but most exciting thing I’ve love to do is a flyback first stage. We’re just missing the billion dollars of capital it would take to try to do that. “But that’s what SpaceX is aspiring to try and make this work, and I think if we show some progress and success, it would inspire other companies and other countries to try it as well. “However, the goal for Falcon 9 is that it ends up being the first fully-reusable launch vehicle.” (Image Left: Inside Dragon capsule during ascent and Falcon 9 injecting Dragon into orbit).